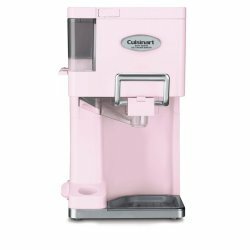 Make professional-quality soft ice cream, yogurt, sorbet, and sherbet right at home with this fully automatic, soft-serve ice-cream maker. Simply pour in the ingredients and turn the dial–no chemicals, salt, or ice required. The unit’s double-insulated freezer bowl holds cold temperatures and makes it possible to produce up to 1-1/2 quarts of ice cream in just 20 minutes. Three built-in condiment dispensers allow for adding sprinkles, mini M&Ms, chocolate chips, and other favorites, mixing them right in to frozen desserts as cones and bowls get filled. A unique pull handle sends ice cream swirling out like with an authentic soft-serve machine. Other highlights include a cone holder that holds a stack of pointed or flat-bottom cones, a drip tray, nonskid feet, and removable parts for easy cleaning. Barbie: A Fairy Secret DVD just $12.49!